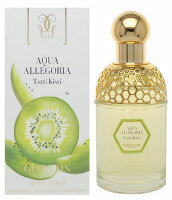 Tutti Kiwi is one of the two entries for 2006 in Guerlain's Aqua Allegoria range. The Aqua Allegoria fragrances tend to be lighter, younger and simpler in composition than those in the regular line, and they are basically limited editions: if they do well, they hang around, but otherwise they hit the chopping block in short order — last year's Orange Magnifica has already disappeared from the Guerlain website, as has my favorite Aqua Allegoria, Anisia Bella. Tutti Kiwi is attributed to perfumer Jean Paul Guerlain, and the notes are tangerine, rhubarb, frosted lemon, kiwi, geranium, mock orange, sandalwood, vanilla and woods. I will start with a disclaimer for anyone who isn't a regular reader: I don't particularly love fruity florals. Beyond that, kiwi is firmly entrenched very near the bottom of the list of fruits I'd like to smell on my person. The first few minutes of Tutti Kiwi, however, were a pleasant surprise: a crisp and sparkling blend of rhubarb and citrus, very tart and slightly green. After that, the kiwi kicks in along with vague floral notes, and the crisp and sparkling part eventually gives way to a rather indistinct fruity floral over a Guerlain-ish base of sandalwood and vanilla. It is a cheerful, summery fragrance, sweeter than I'd like but not so sweet as to smell like something marketed to the pre-teen set. If you like kiwi, it might be just the thing for you. I do like it better than last year's Orange Magnifica and Pivoine Magnifica, both of which struck me as relatively bland for the Aqua Allegoria line, but I have no desire whatsover to own or wear it. 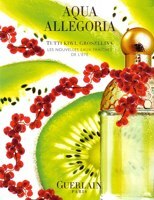 I'm waiting to smell Grosellina, the other Aqua Allegoria for 2006, although I'm not sure red currant will be my thing either. Please comment if you've tried it. Tutti Kiwi appears to be exclusive (online, anyway) to sephora at the moment, but can also be found at Bergdorf Goodman and will eventually be sold at most major department stores. And of course, it is bound to hit the discounters eventually. Let's see: Sous le Vent and Attrape Coeur vs. Tutti Kiwi and Grosellina. Sous le Vent or Tutti Kiwi??? Why, oh why, is this such a tough decision??? Gee, I just can't imagine which ones I would choose, yuck, yuck. Be not ye afraid…I actually thought it was rather too much on a paper strip, but on skin it is quite harmless. It is better than many AAs but certainly not for me. ROFL reading dear R's comment above!! I bet she will be getting a bottle of Sous le Vent. Just tried it today and it is a soft and spicy version of Vol de Nuit on me. Ah, then I don't need Sous Le Vent N! Hope all is well with you too. The lovely Francoise of Guerlain in Paris sent me a sample of these two new AAs along with my bottle of Muguet and Philtre d'Amour. Will try them this week and report back. So, is Sous le Vent released now? What about Quand Vient l'Ete? I do too…wish they would do a straight rhubarb Aqua Allegoria. Sous Le Vent is out, and according to Bois de Jasmin so is Quand Vient L'Ete (V says she smelled it there last year). The names of the new Guerlains are not really appealing, but I know..just know, that I must have them just the same. Thanks for the review R.
Arghgh! Arhggh! OK this is wayyy off-topic and not even a comment on this particular posting but I just want to shout from the rooftop (ok, so not really, just on NST) that I've just been to the Bond No. 9 store in Bleecker St. and the devil's got my soul! Rigth next door is the Magnolia Bakery, so it's like I went to Heaven and found that next to it, there's another Heaven! I have to decide on what to get. Neither of these two (Tutti Kiwi, Grosellina) were interesting enough to bear the name of Guerlain. Maybe, if they came out under another label, I would have been more inclined to judge them less harshly. Yes, Quand Vient l'Ete has been out for about a year already. Cupcakes and perfume – it doesn't get any better than that! I dream of going there next time I'm in NYC. They really aren't appealing, are they? Tutti Kiwi makes it sound like an Escada summer LE, and Grosellina obviously doesn't work well in English. Was that your first Bond sniffathon? And what did you like? It is so nice that you can buy smaller amounts in the stores, so if you love more than 1 you can do 1 oz each. You are tougher than I am, V — I don't expect so very much from the Aqua Allegorias. Then again, I like Anisia Bella better than L'Instant. Yes, worked in NYC many many times, but never found the time to swing by. I liked Noho, and Fashion Ave. I find that I can wear the Bond signature one too, even though it's intended to be more masculine. They have a new one called Peace, that's nice as well, (yes, I know, everything is nice) but the dry-down is not me. I see I am going to have to say something nice ;-p I really am enjoying the two new AAs. Ok, they won't make a classics list, and they could easily be packaged under a different brand, but they're nice, simple summer fruity scents that won't give you a toothache. I'm a sucker for 'different' fruits in fruity scents, so of course I bought them! I wish they'd do a starfuit scent, a honeydew melon and maybe also a papaya one for the AA line – I'd buy those too! Would agree with “nice, simple summer fruity scents”…just isn't my favorite category. Papaya is a great idea though…I liked several of last year's mango releases actually. Well of course I will if I ever get my hands on any. Wasn't thrilled by Vega though. Okay, I tried these this morning. I actually liked both of them, as fruity scents go they were nice. The Grosellina one reminded me a bit of Cartier Delices, but since I already have that one, I'd be more inclined to buy the Tutti Kiwi, which had a bit of a woody vanilla drydown. 2 for 2, not bad! Now I am even more curious to smell the Grosellina. I tried them both today at the Guerlain counter, I found the Kiwi one a exact replica of a kiwi syrup very famous in Spain, Kiwi Rives, it reminds me as well to the Caudalie Fleur de Vigne a bit, very fruity indeed, but very synthetic kiwi. The Grosellina one was a pleasant surprise, although I dont like the sourness of the berries this one have a different edge to it, the beautiful acacia flower stays in my skin like a very light and almost powdery sweet honey. Quite a nice summery fragrance. Thanks, I still haven't tried the Grosellina so nice to hear it is worth trying.